The crowds are not as big during the Myrtle Beach Fall Rally as they are during the Myrtle Beach Bike Week Spring Rally, but the event still draws a lot of bikers who take advantage of the lower accommodation rates and great weather. For some this bike rally is a favorite due to cooler temperatures and less traffic to make for a more enjoyable riding experience. 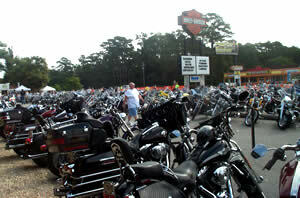 You can still participate in all that a great bike week has to offer with numerous vendors and contests. The entertainment is everything you've come to expect during a Myrtle Beach Bike week plus the events that bikers look forward to during a bike rally, including poker runs and swap meets. to check rates or book online. implementation of a few policies created to accommodate our guests more comfortably. Sign-up below to receive Special Deals on our Myrtle Beach Condos as well as news about what's happening at The Myrtle Beach Resort, in Myrtle Beach, and all along the Grand Strand. These Fantastic Deals are only available to recipients of our Vacation Deals Newsletter.